Launching your official mobile app is exciting and we work with you to ensure maximum customer engagement. Before your mobile app is launched, we will help prepare announcements on your website and social media pages. 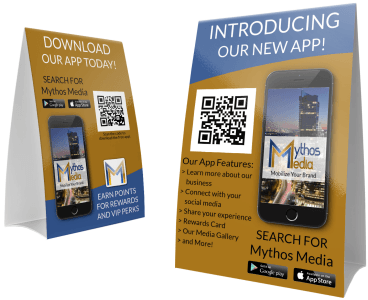 To promote your mobile app at your place of business, we also create customized printed marketing materials to get the attention of your customers! Custom designed assets with your business logos, pictures, colors, app screenshot, and marketplace icon. The top capabilities and features of your mobile app are detailed to get your customers interested. Customers scan the QR code with their smartphones to install your mobile app within seconds. Table Tents in businesses are a useful form of promotional assets and a great way to increase the amount of downloads for your mobile app. Customers are more inclined to read promotions when they are waiting for their food or service, so it is a great time to get them to download your new mobile app! 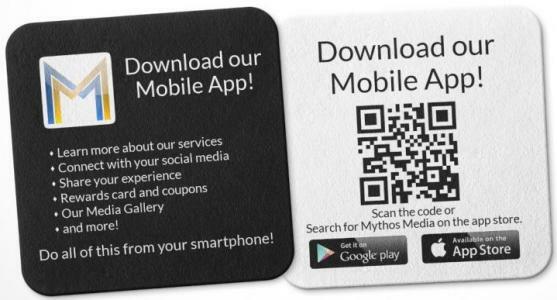 Customized coasters with information about your app and your custom QR code will make downloading easy for your customers. They are a great way to strengthen the visibility of your new mobile app. What better time to market your new app to your loyal customers then when they are sitting and waiting for a table. 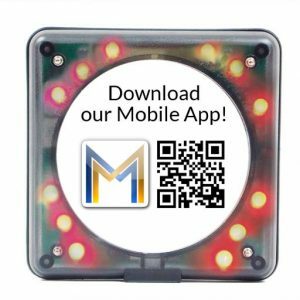 Include beeper stickers, with your restaurant’s custom QR code to encourage your customers to download your app. They can browse the app and your menu while they wait! 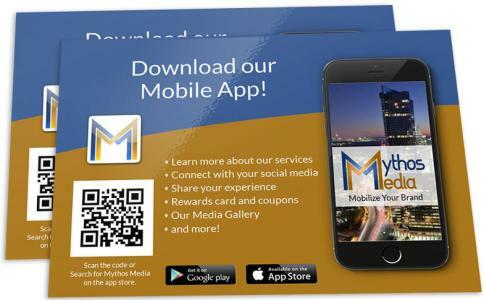 Promotional Postcards are a great way to inform your customers about your new mobile app. Postcards provide a little more space for additional information. You can use postcards for table promotions, menu inserts, reception desks, handouts at checkout, and other avenues. You could even send them as a direct mailer to reach your loyal customers at home! Please fill out the form below and we will get started on your request.